Today is the day! 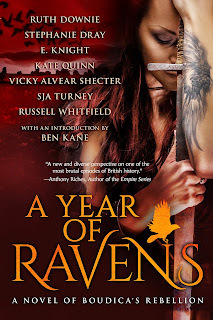 I'm so thrilled to announce the release of an epic novel that has been long in the works: A Year of Ravens: A Novel of Boudica's Rebellion. 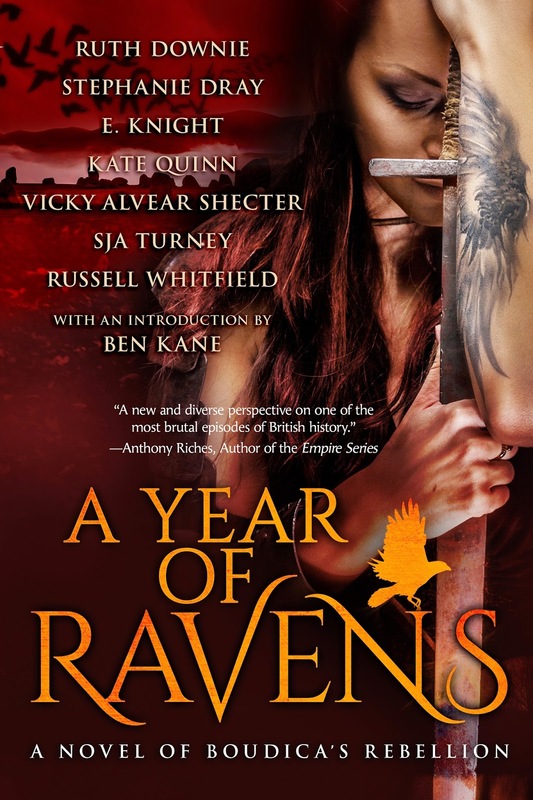 A Year of Ravens is told in 7 parts by myself and 6 authors of the H: Team! Just as with our award-winning collaboration last year, A Day of Fire: A Novel of Pompeii, was told in progressing parts, so is Ravens. I really think you'll enjoy it! 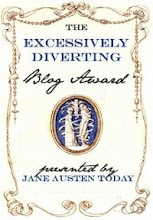 Below, I've shared an excerpt from my part, The Daughters, and I do hope you'll enjoy it! Britannia: land of mist and magic clinging to the western edge of the Roman Empire. A red-haired queen named Boudica led her people in a desperate rebellion against the might of Rome, an epic struggle destined to consume heroes and cowards, young and old, Roman and Briton... and these are their stories. A calculating queen foresees the fires of rebellion in a king's death. 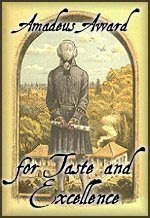 A conflicted young warrior finds himself torn between loyalties to tribe and to Rome. A pair of fiery princesses fight to salvage the pieces of their mother’s dream as the ravens circle. A novel in seven parts, overlapping stories of warriors and peacemakers, queens and slaves, Romans and Britons who cross paths during Boudica’s epic rebellion. But who will survive to see the dawn of a new Britannia, and who will fall to feed the ravens? However, I was anything but, and I knew it. “You have everything to fear of this world, Daughters,” my mother said as we hunched by the river, miles from the battlefield, our lathered horses greedily drinking up the offered water. The waning light of the setting sun surrounded us, and the cold was bitter. Tall grasses stirred in the breeze, batting wearily at my shoulders while only the occasional glimmer of light broke the sullen darkness of the waters, rippling when Mother dipped her hands into the depths. She cupped her hands, pulling the icy liquid to wash the blood from her face. I never thought victory was possible. 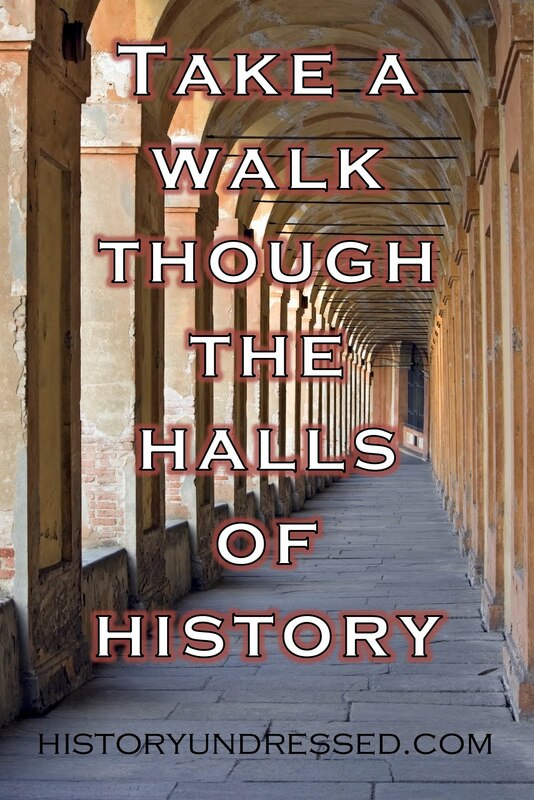 All through the thirteen years since my birth, our people had struggled against Roman edicts. No swords. No way to protect ourselves but to rely on the Romans. Thank the gods our hunters were good with arrows and slingshots. And thank the gods as well for mother’s insight, that she continued with our tribe’s secret training and hoarding of weapons—had she not, we might have perished a year ago. No, I never thought victory possible. But I know our defeat for a certainty now. Our people had been slaughtered. And Mother was injured, cut deep in a place I’d seen kill warriors slowly. A wound I’d tended on many in the last year, in the healing tents where I'd honed my skills. We had been running since the battle's end yesterday, only stopping briefly to rest as night fell and continuing on as a blood-red dawn rose. Now another night was falling, and Sorcha had come up with a plan, a haphazard one. We would seek refuge and assistance in the north with Venutius, the estranged husband of Queen Cartimandua of the Brigantes. Since he didn’t support the Romans, he was the most likely ally we’d be able to find at a safe distance from the battlefield. At the very least, he could keep us hidden from Rome until mother was healed. Mother attempted to mount her borrowed horse, refusing Sorcha’s help at first, though it was painfully obvious she needed the assistance. “Mother,” I said softly, touching her shoulder. A shuddering sigh of defeat escaped her. Not another word was exchanged, but she allowed both Sorcha and myself to lift her mighty body up onto the saddle. Sorcha mounted the prized mare of one of our warriors—that warrior was likely dead now. Andecarus was his name, and I heard Sorcha whisper it to the horse. With a deep sigh, I climbed onto the saddle behind my mother. We had but two horses, and with the both of us sharing this one while Sorcha rode the other, it made the journey slower. My muscles were sore. My head was heavy. My sister, strong and determined, sat tall before us. As the horse walked, every sway of my body jarred the aches in my bones. It was worse for my mother, who leaned over the withers of our mount. I gripped the reins around her middle when the leather slipped from her fingers. I had insisted on riding behind Mother; told her that as a brave fighter, I would take up the rear guard—but it wasn’t bravery. I was too afraid to be in the front with Sorcha. Too afraid that Sorcha would sense my fear that we had reached the end and call me a coward for thinking it. Sorcha . . . My older sister was the most capable girl I’d ever met. Even before we’d both grown breasts, she was always the leader. Like Mother. I'd hoped that I would become a warrior, too, since my father was one, and I looked like him. But I could barely cut a hunk of venison, let alone cut an enemy with a sword. My only skill seemed to be for the healing arts—at best, I'd make a budding priestess. Sorcha, now—she was a master with a blade.